Perhaps you catch them walking up to your flat or up the long walkway to your front door. Admit it: Have you ever hid in your bathroom? Pretended to be on the phone? Called your spouse? Acted like you were heading to a world-defining meeting? 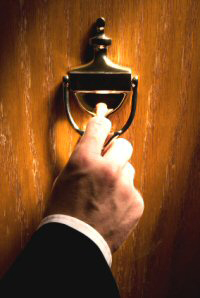 Here in Cayman, usually around this time of year and again in the Spring is open season for Jehovah's Witnesses to come 'round & lovingly pound at your door. Usually very kind, eager to start a conversation, and unwaveringly convinced of their views about something absolutely foundational to our faith as Christians: The deity of Jesus Christ. What they are saying. Jehovah's Witnesses are convinced that there is one God -- and Jesus Christ is not Him. One of the first evidences out of their mouth: "Even the Bible (yes, your Bible) says that Jesus Christ was a created being." They center this around verses like Colossians 1:15: "He [Christ] is the image of the invisible God, the firstborn of all creation." On the surface, this may throw us for a loop -- at the very least, stopping the conversation and, at the very most, planting seeds of doubt in our own minds. How we might respond. The following is a good blog post that will help us address the claim by Jehovah's Witnesses that the Bible says Jesus Christ is not God but a created being like you and I. "But in your hearts set apart Christ as Lord. Always be prepared to give an answer to everyone who asks you to give you the reason for the hope that you have, but do so with gentleness and respect." An approach I've found helpful is offering to listen for 20-30 minutes and then (either at that or inviting them to return again) ask if they'd be willing to listen to your thoughts & concerns for 20-30 minutes. I did this with some Mormon folks once and we struck up quite a relationship - two of the dudes even asked for some of 'my' literature. Well said Pastor O. Love the encouragement and the gentle way to handle these situations.